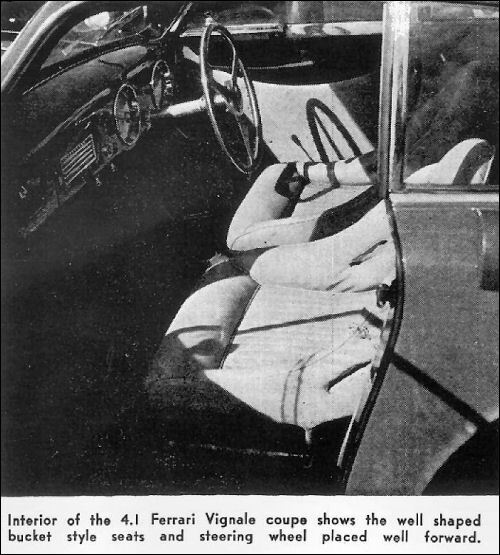 In the latest Ferrari the five-speed gearbox has been abandoned in favour of the more normal four-speed type, and although the Grand Prix type Ferraris employ the de Dion axle a live rear axle mounted on semi-elliptic springs continues to be used on the sporting models. Whereas, however, in previous years driving torque has been contained by a pair of leaf springs on each side, one superimposed upon the other, on the latest model shown at Paris a short radius arm performs this service in conjunction with a single leaf spring on each side. The car now also has a very much wider tubular frame than heretofore so as to give maximum support for the closed body types which are now invariably used for competition purposes. The same basic type of twelve-cylinder engine has been employed by Ferrari with cylinder bores varying from 55 to 80 mm., and piston strokes lying between 52.5 and 74.5 mm. These changes give variations in swept volume in ratio 1 : 3 and in fact from 1½ to 4½ litres. The latest type of sports-car has a capacity of 3.0 litres and it seems established that in this class of car the increased power and torque of larger engines are scarcely worth while in view of their greater fuel consumption and difficulty in handling. 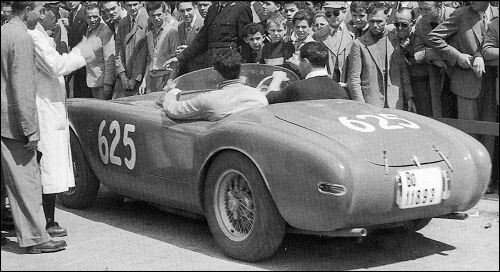 This is borne out by the fact that the Ferrari which won the Mille Miglia and a similar car which put up the record lap at Le Mans both had engines of under 3-litre capacity although in both races Ferraris with over 4-litre engines were competing. Produkcja 166 MM została wznowiona. Druga seria ma silnik o większej mocy. 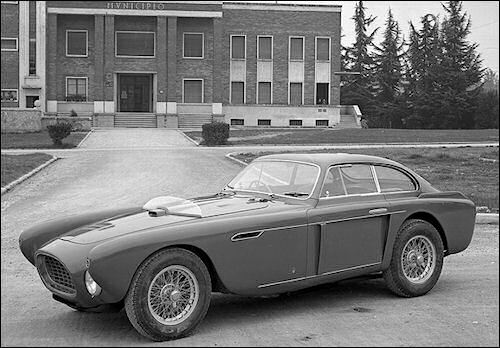 195 Inter (V12 cyl, 2341 cm³, 135 cv; wb: 2500 mm) - end of prod. 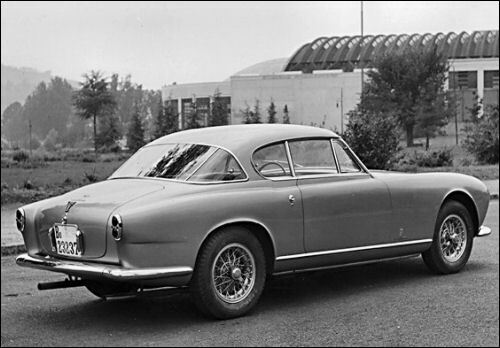 195 Inter by Ghia (#0183EL) WRONG! 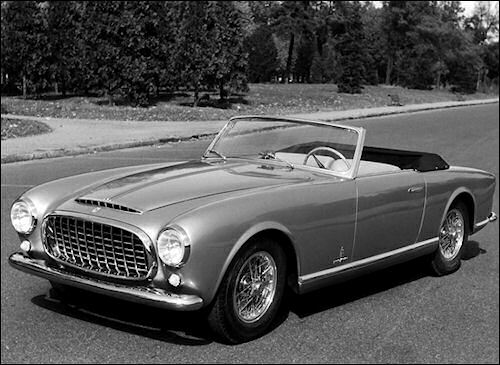 212 Inter Cabriolet Pinin Farina (#0177E). 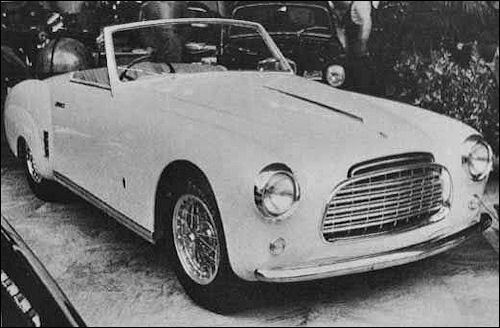 The first Ferrari with Pinin Farina body. 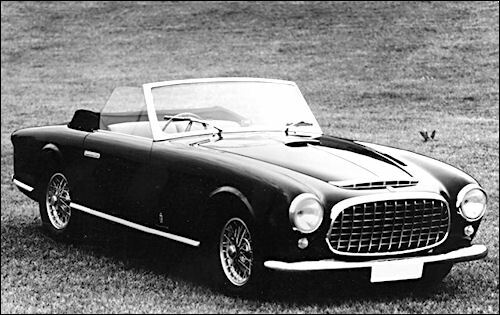 212 Inter Cabriolet by Ghia (#0191EL). 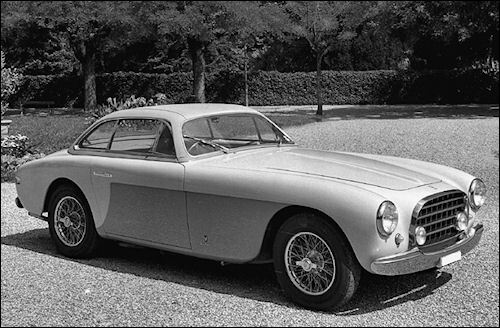 This car was displayed at Geneva Motor Show along with Coupé by Ghia-Aigle (#0195EL). 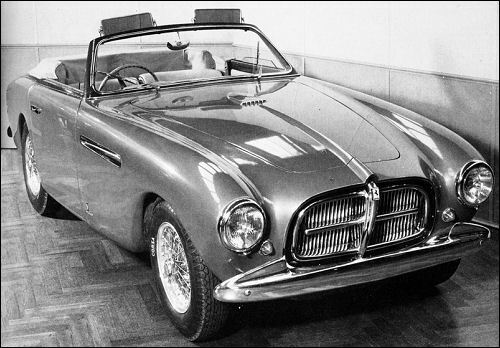 212 Inter Cabriolet Pinin Farina (#0235EU). This car was displayed the show in Paris . 212 Inter Coupé by Ghia (#0233EL) displayed at Paris Motor Show. 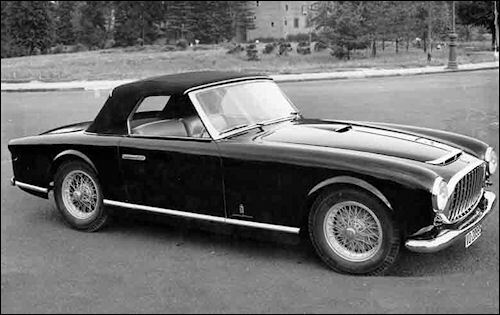 The road testing of Phil Hill's highly successful Type 212 Ferrari represents a novelty to any one accustomed to the more, shall we say, "everyday" sports car. This expensive bit of extreme high performance machinery was recently acquired by Hill after several previous mounts had shown themselves unable to meet the demands of Hill's competition driving. 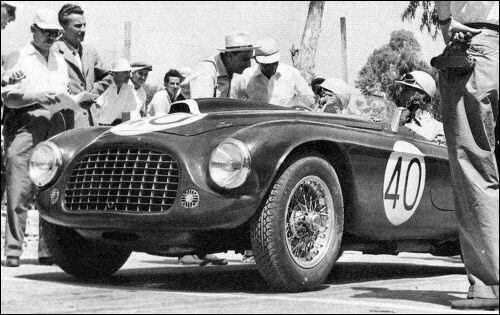 In ordering the car Phil asked Road and Track's Italian Office Director, Michele Vernola, to find him something that would win; and, if the recent Hill-Ferrari victory at Torrey Pines is any criterion, this fine young West Coast driver certainly has had his order fulfilled. 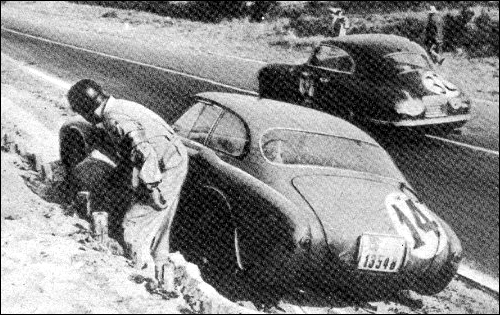 Readers will recall (Road and Track, October 1952) that he completely lapped the entire field at Torrey Pines while under frantic slow-up pleas of his pit crew. On the first laps Phil in. creased his lead over the other competitors - fast Allards and the like-while revving the engine as high as 7500. As the laps passed rapidly under his wheels he brought the rpm down progressively; from 7500 to 7000; and then to 6500. At 6000 rpm he was still building a lead and his pit was still flashing the "slow-up". Finally he was found, at a maximum of 5500 rpm, to be still pulling away. In fact, it was with that maximum that he finally lapped the 2nd place contender: A Mercury Special of superlative weight/hp ratio. Several of the cars which followed the Ferrari across the finish line over a lap later had somewhat better initial acceleration. Now a road racing circuit combines (disregarding hills and bumps) only turns and straights, so we may assume that the Ferrari enjoyed its greatest advantage in its ability to get thru the corners rapidly. 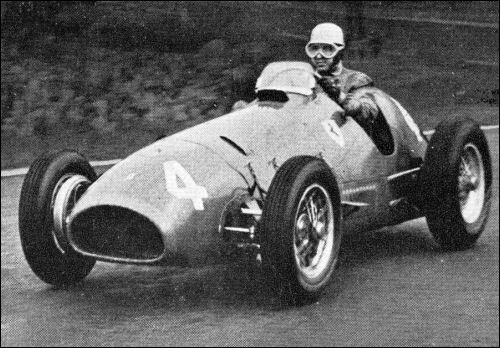 This is not to negate Phil Hill's driving ability, for he has previously proved that there are few drivers who can keep up with him given equal cars. 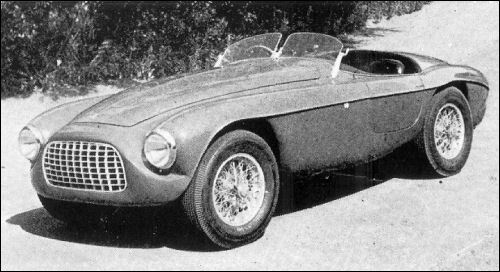 When Hill took delivery on the Touring-bodied V-12 and had raced in one event - Golden Gate Road Races -he found that the car exhibited roll characteristics which were unsatisfactory - to him, at least. 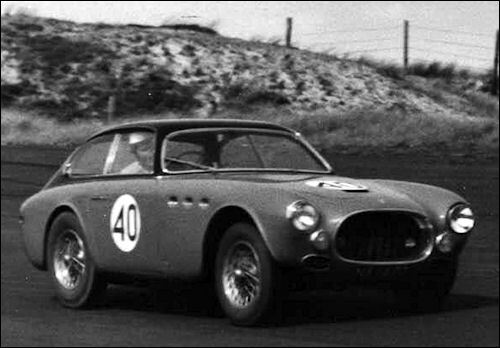 Certain attentions were thereupon paid to the shock absorbers which (along with the addition of an anti-roll bar in front) have given the Ferrari different qualities in a turn. The inside rear wheel is now prevented from lifting as easily; but there is less front wheel adhesion to the ground, which can be somewhat compensated for by tire pressures. As a result, the 212 may now be driven thru corners faster,bhy the relatively simple expedient of allowing the throttle to be applied sooner when accelerating into the straights. However, the car demands more driving ability in its present form. Those who contemplate the purchase of a like vehicle will want to study thoroly the possible disadvantages of attempting similar modifications. The Ferrari as originally delivered would unquestionably suit better the average driver's limitations. Before leaving the discussion of handling characteristics ... the steering (by worm and nut) is light and positive; naturally it would he, with the maker's experience in the construction of Grand Prix cars. Yet, there is a gratifying "feel of the road" in the lightweight wood and aluminum steering wheel which will satisfy all but the "a-car-is-just-transportation" drivers. The low steering ratio itself allows full advantage to be taken of the car's manuverability. 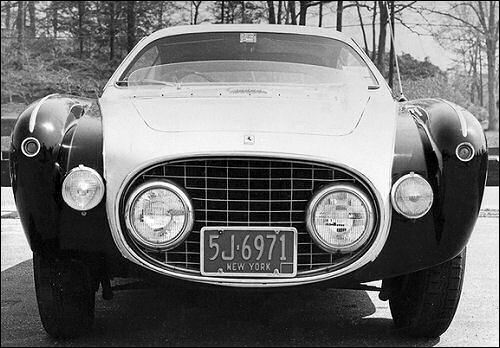 The competition ride of the Ferrari might he called rough by anyone, accustomed to today's ideas of super-soft suspension, but the enthusiast will welcome the firmness and security. 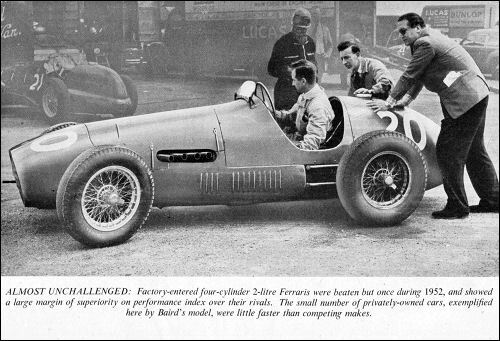 The driver position in this particular car seems good by Ferrari standards; some of the cars from the factory seem to he built for rather undersized drivers. The foot pedals, too, may seem, on first acquaintance, to he somewhat close together-particularly if the driver is accustomed to the great wide-open spaces on the floorboards of many current products. However, in a car designed for fun and/or competition (with some emphasis on the latter) one would naturally make allowances for a certain snugness in the placement of brake, clutch, and accelerator pedals - the better to allow simultaneous braking and accelerating, and the quick foot-functioning necessary to successful competition driving. The 12-inch, finned aluminum brakes (twin leading shoe) next to the handsome knock-off wire wheels are certainly as efficient as most in the world today. 100% is the theoretically perfect efficiency reading on Road and Track's Tapley Brake Meter, but no car is apt to record that figure in practice. Actually, the Ferrari's 90% is a good 3% higher than any car tested by the staff to date. Phil Hill states that there is no sign of fade (while racing) until long after the point where the other cars he has driven have lost all semblance of braking ability. By the end of the Torrey Pines Races, the car lost some of its stopping efficiency, but Hill was applying the brake pedal with far greater severity than in past races, in other cars. 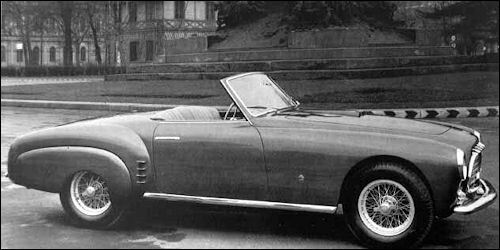 Compared to the run-of-the-mill production sports car, Hill's Ferrari carries an unusually light aluminum body, fitted over a thin but stiff tubular framework. The coachwork by Touring seems to be of a high standard. Such things as heavy door latches and corresponding hardware are eliminated - logically enough in a competition sports car. 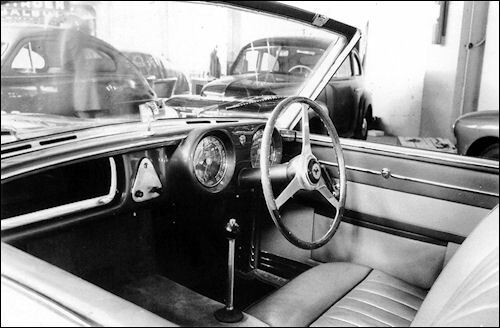 There is no top included amongst the car's accessories; furthermore, the character of the twin racing windshields prohibits the owner from having a top fitted. 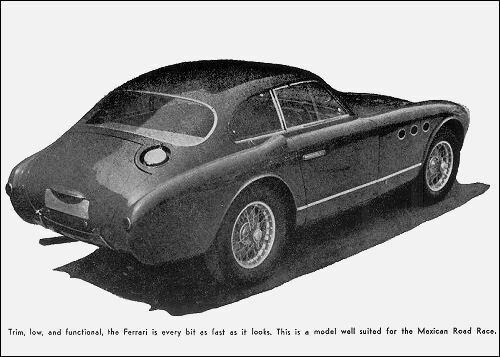 Lest the prospective buyer be frightened away from the 212 Ferrari ... fearing as he may, that the car could not be used in bad weather - it must be remembered that the chassis may be ordered with any one of a variety of bodies. 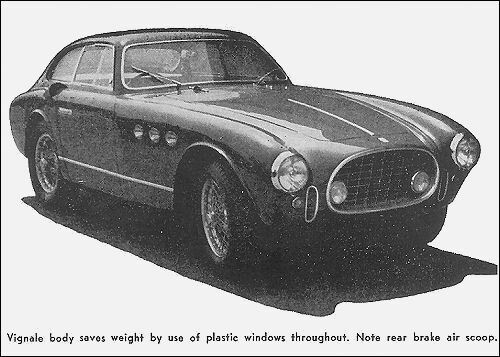 A more conventional windshield would hardly cause anxiety in the Touring works; this carozzeria being currently employed in supplying not only limousines for those who want them, but everything from single sealer competition cars to luxurious convertibles and coupes. Thinking along these same lines the magnificent 2.5 litre V-12 Ferrari engine, with its single overhead camshaft, comes in many stages of tune: From the triple (dual-throat Weber) carburetor model (as is under discussion) to the single carburetor version. 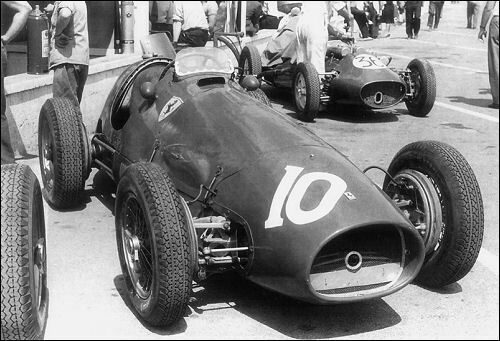 These engines in lower stages of tune would satisfy the occasional enthusiast more readily, but the fact remains that Hill's Ferrari idles at a comfortable 500 rpm - tho the multiplicity of cylinders gives the impression of much greater engine speed. 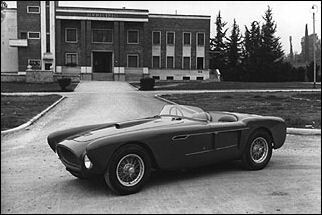 As to design, the engine continues Maestro Ferrari's practice of enthusiasm for V-12 development. 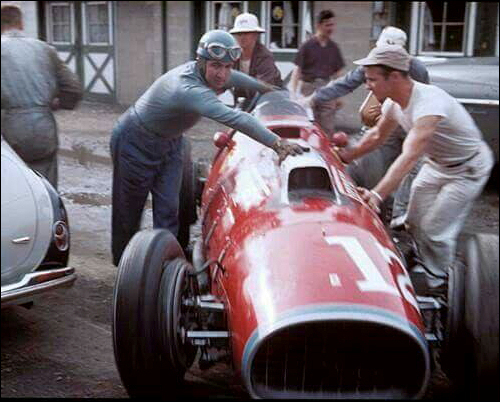 Of the famous Ferrari engines, the smallest is the Type 166 which is a 1.9 litre. 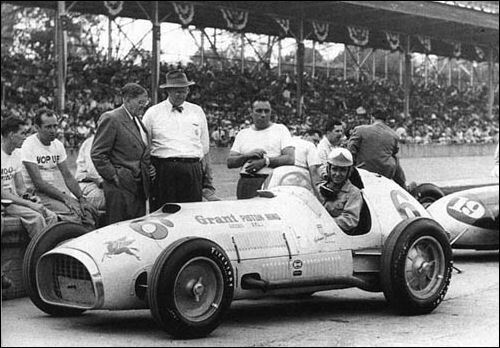 Between this engine and Phil Hill's 2.5, is a 2.3; and recently, in the past few months, the 2.7 sports cars have been winning the lion's share of European victories. The most recent introduction is the 2.9 engine, which promises to be the best all-around competition sports car for many months to come. The largest engine in the sports car class is the 4.1 litre, Tipo America, which excell in the longer races, i.e., Mille Miglia, etc. where its great torque is at an advantage. Rumors persist that the 4½ litre engine has been installed in a sports car chassis - on special order. To date none of these has appeared on the roads. In any event, all these engines show the marks of Ferrari design and vary only in detail. 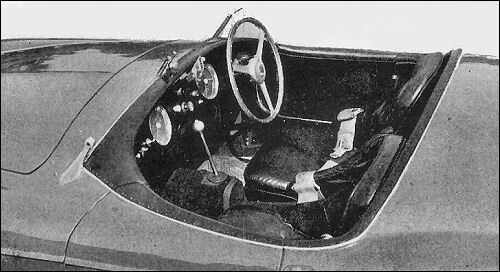 Those accustomed to Italian clutch action will know that this mechanism on the Ferrari is "all-in or all-out", and the owner will want to carefully instruct his maiden aunt when she borrows his Ferrari for her daily trips to the market. Once the proper clutching and de-clutching technique is acquired, no further trouble is experienced, but the novice may come away from his first attempt thru the Ferrari gears with some amazement at the strength of the Italian clutch springs. 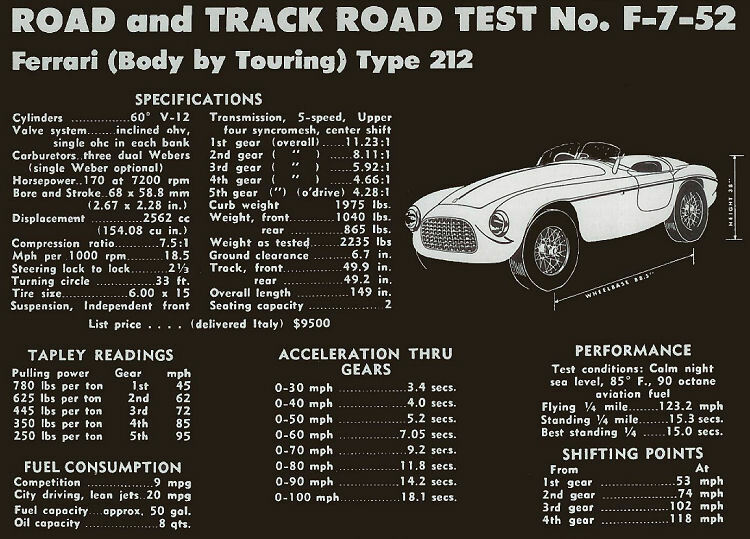 It might be interesting for the readers to know that during the actual recording of the test figures on the 212, a different technique was necessary than that used with the average high performance sports car. In fact, it should he plainly stated: the uninitiated novice does not simply seat himself in the Ferrari and make off with the greatest aplomb. And the expedient of revving the engine to near its maximum torque and then abruptly releasing the clutch, does not make for the best tuned Ferrari runs over a measured distance. To be exact, this method of procedure avails little else than damage to the clutch, gearbox, or rear end. Proper Ferrari procedure is to release the clutch with the engine near its idle point - only depressing the accelerator after the drive train is completely coupled. For the skeptic's information, European rood racing circuits are strewn with bits and pieces of Ferrari gears-left behind by over-zealous drivers. The gearbox is equipped with a reverse, and five forward speeds, of which the four highest are syncromesh ... And 5th gear is overdrive - less than 1 to 1. However, the syncromesh does not allow the margin of error common to most transmissions. What it does do is allow the experienced margin for a slight mistake in shifting. But anyone accustomed to sloppy methods of gear changing would be forced to revise his technique in the Ferrari. 340 America (V12 cyl, 4102 cm³, 220 cv; wb: 2420 mm) - end of prod. 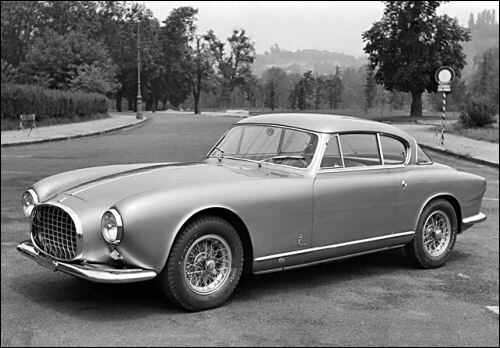 '51 340 America Berlinetta by Touring (#0122A) displayed at 35th Salon de l'Automobile in Brussels. It isn't often that we have the opportunity to road test a car capable of covering two miles in less than a minute. Recently, however, we tested two such cars on the same day. 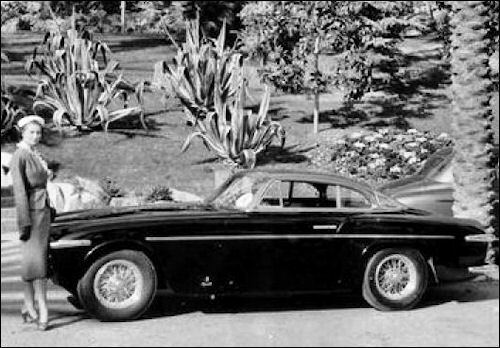 The first one, the Jaguar XK-120 C, was fully reported in the August issue of Road and Track. 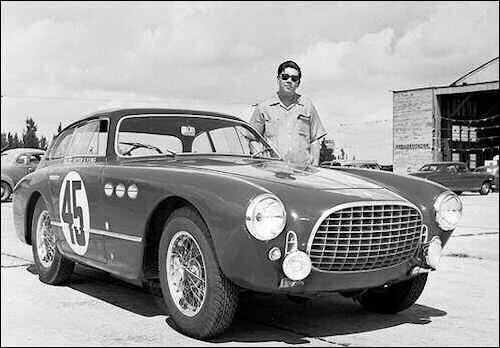 The second car is the 4.1 Ferrari Coupe owned by Maston Gregory of Kansas City, Missouri. 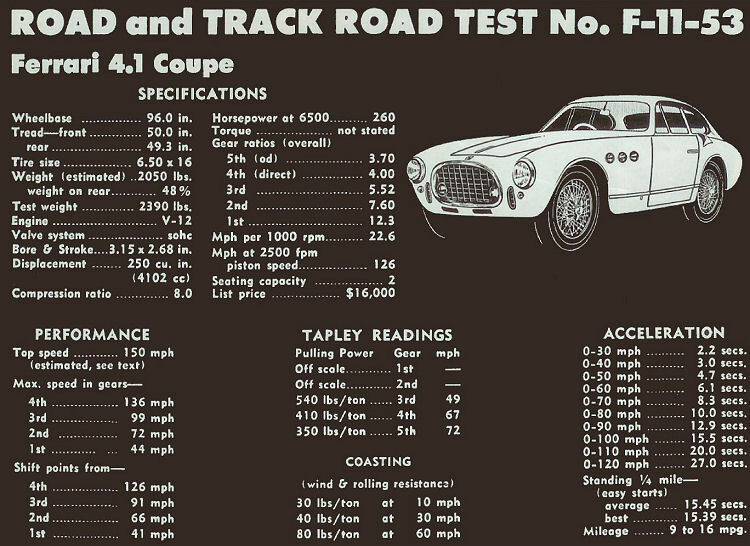 It was only through Mr. Gregory's great enthusiasm for sports cars in general, and Road and Track magazine in particular, that we are able to present this road test. 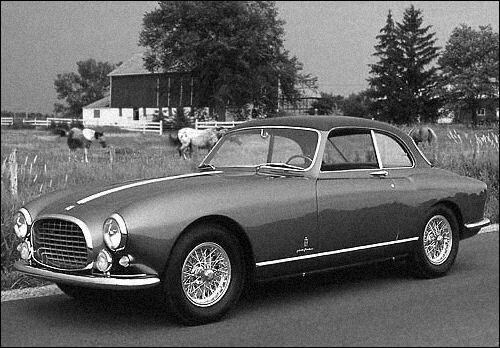 No two Ferraris are ever quite alike, and this Vignale bodied 4.1 is rather exceptional. 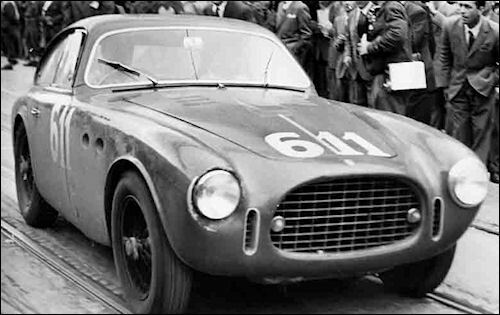 In the first place, it is believed to be the actual car with which Simone led the 1952 Le Mans race during the early hours, but retired with undisclosed troubles. The body is much lighter than those normally supplied with the "America" (model 340) cars, and the 250 cu in. 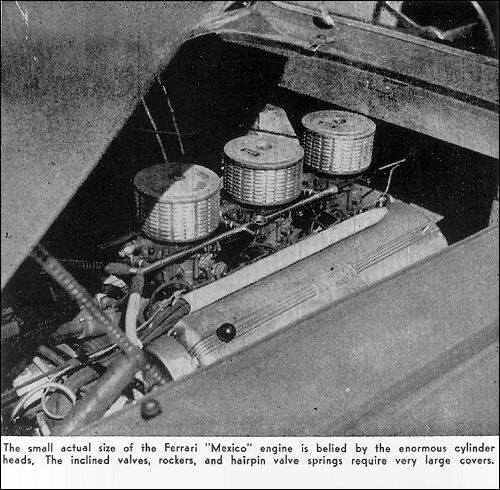 engine is the early "Mexico" type. A factory letter states that the developed bhp of this particular engine is 260 at 6500 rpm. This compares with 220 bhp at 6000 rpm for the normal "America" engine, and 300 bhp claimed for the latest "Mexico" powerplants (which have three four-barrel Weber carburetors). Last month we reported that the "C" type Jaguar gave the best set of acceleration figures we had ever recorded. The 4.1 Ferrari, with less weight, more horsepower, and 5 speeds forward, readily surpasses the Jaguar performance. It is well-known that the very factors which give the Ferrari its outstanding power to weight ratio result in a certain degree of fragility. Standing starts put severe strains on such parts as the clutch, transmission, and rear axle, and in deference to the cost of replacements all of our checks on acceleration were made with considerable caution. This effects initial acceleration since full throttle was not applied until over 1000 rpm was attained. 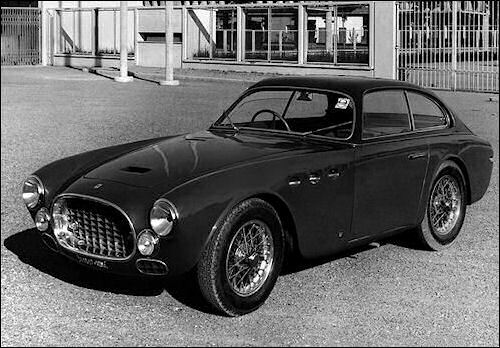 There are very few sports cars which can better the times recorded for this Ferrari, though certainly a factory tuned and prepared model could do even better. One of the most remarkable aspects of the performance is the usefulness of the 5 forward speeds. With a wide range of rpm available, each speed has a place and a purpose. First gear enables the car to literally leap to 40 mph - 0 to 40 taking just 3 seconds flat. Second gear is well adapted for town driving with so much acceleration available that 10 to 60 mph can be attained in 7 seconds without exceeding 6000 rpm. Third gear gives highway acceleration from 15 to 90 mph in 12.3 seconds. This is an admirable ratio for winding mountain roads, or for getting around slow moving cars on a narrow, crowded highway. Fourth gear is direct drive, or high gear, and the amazing flexibility of the V-12 engine provides a useful speed range of 20 to over 130 mph. As a matter of general interest we checked acceleration in fourth gear from 30 to 80 mph in exactly 12.2 sees. and 30 to 125 mph in 32.6 secs. Fifth gear is an overdrive, and though intended primarily for extended duration in the vicinity of 100 mph and over, it is possible to allow the speed to drop as low as 20 mph and still accelerate far more rapidly than any stock American car. The only acceleration times we obtained in 5th gear were 45 to 70 mph in 5.83 seconds and 45 to 90 mph in 13.4 seconds. Top Speed . . .
On a car of this calibre and potential it is impossible to make an accurately timed top speed check anywhere except on the Bonneville Salt Flats. We did manage one timed run in 4th gear at 128.57 mph, and the revs were still climbing - and more interesting, still below the "red line" of 6500 rpm. The maximum speeds given in the table for 1st, 2nd, 3rd, and 4th are equivalent to 6500 rpm. More speed would be possible by revving beyond the peaking speed of the engine, but we didn't try it. A limit of 6000 rpm was used during, all the acceleration tests. The factory says the top speed in 5th gear is 240 kph (151 mph) and we are more than willing to accept this figure, though the car felt perfectly stable and safe at all speeds. It would be absurd to say that the 4.1 Ferrari offers handling powers, cornering ability, and steering qualities to match its fantastic performance. What it does offer is a combination of qualities which, in the hands of an experienced driver (such as the owner in this case), makes it possible to drive safely over all types of roads far faster than any average driver (like us) would ever dream could be possible. The ride is firm as would be expected. A fair estimate would be to compare the ride with the TC MG - though actually it's somewhat better because it is flatter with very little of the TC pitching tendency. On corners there is absolutely no roll, and while there may he cars that can "get around" faster, we have yet to find one. The steering is not quite so "perfect." Though requiring only 2.3 turns lock to lock, there is a lack of feel during low speed driving, coupled with the need for considerable effort to turn sharply. Above 30 mph the steering becomes light and is very accurate. However, at around 60 mph on slightly rough surfaces the entire steering column sometimes vibrates viciously - a fault which all Ferrari owners seem to accept without complaint. General Comment . . . The "Fabulous Ferrari" lives up to all the thousands of words which have been written about it. It is indeed a sports car which is without an equal - a car for the sportsman and connoisseur. 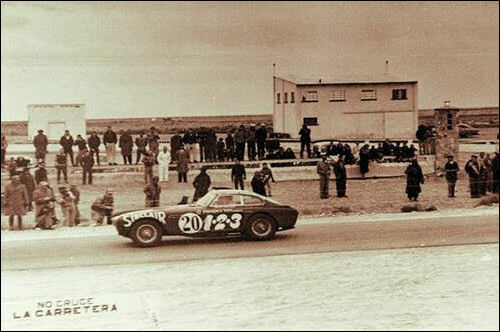 On the other hand, its successful racing heritage is very evident. The engine and transmission make a lot of noise - a racket which one unkind soul likened to a threshing machine. The first time we took off hard through the gears it sounded like the whole works was coming apart. However, a short ride in one of the "softer" 340 models convinced us that the extra weight of sound deadening materials made a very considerable improvement. A serious disadvantage of the 4.1 Ferrari is the transmission. As near as we could ascertain, the 4.1 "box" is dimensionally the same as the smaller engined cars. In order to withstand the higher torque of the 4.1 engine, wider and stronger gears are used, but in order to do this the shifting is by straight dog clutch without benefit of syncronizers. Satisfactory up-shifts require either a definite pause or a double-clutching routine which accomplishes the same purpose. Down shifts take real skill and during the performance tests, it was a real thrill to watch Mr. Gregory practice "racing changes" using the heel and toe technique to perfection - and never missing once. However, the car obviously demands considerable skill to drive near the limit of its capabilities in a road race event. A minor criticism involves the spacing of the three upper ratios, 5.52, 4.00, and 3.70 respectively. It seemed to us that the middle ratio was too close to the 3.70 overdrive ratio and that something around 4.40 instead of 4.00 to 1 would have been more desirable for direct drive. The seats and the driver's position were without fault and we liked the typical Italian wheel location, well forward so that one tends to steer more with the back and shoulder muscles. A close-up wheel requires use of arm muscles only and is much more tiring on long trips. 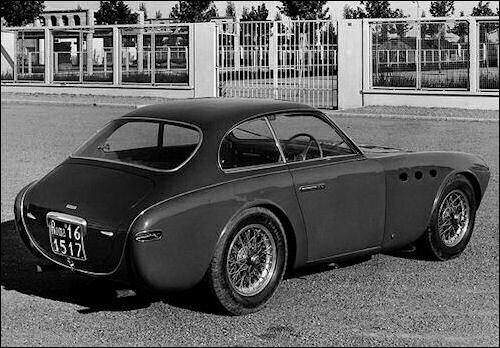 This Vignale coupe, like most Ferraris, had right-hand drive, but left-hand drive is available for those who demand it. The brakes are extremely powerful and with the enormous lining area provided are virtually impossible to fade. However, it did take more pedal pressure to stop the car than might be expected. The short stubby gear shift lever also took considerable force to move it and a little better mechanical advantage would reduce this effort at the expense of longer knob "travel." 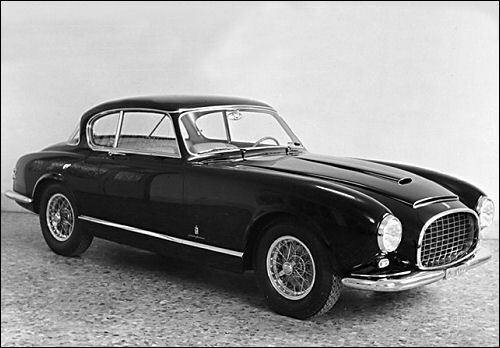 Despite some faults, the 4.1 Ferrari is a type of car which has not been available since the death of Ettore Bugatti. 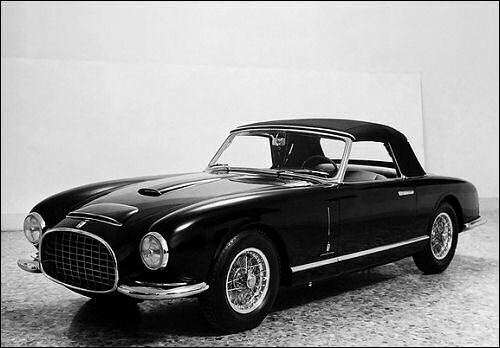 The fact than Enzo Ferrari can produce such machines in Italy, while we in America build nothing at all that can compare (except for a few Cunninghams) is a sad commentary on American mass production. 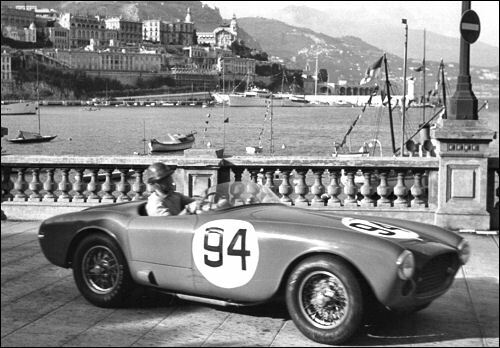 225 S Spyder by Vignale (#0154ED) winning GP Monaco. Bracco za kierownicą 250 S na trasie zwycięskiego Mille Miglia. 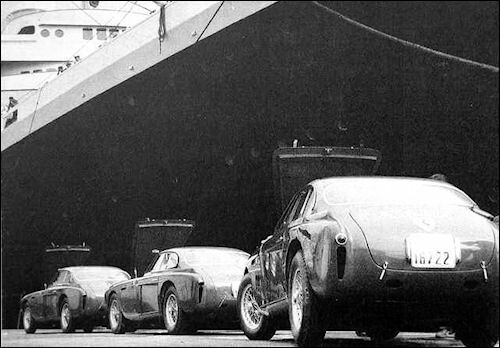 Three 340 Mexico on their way to Carrera Panamericana. Displayed at Paris Motor Show. 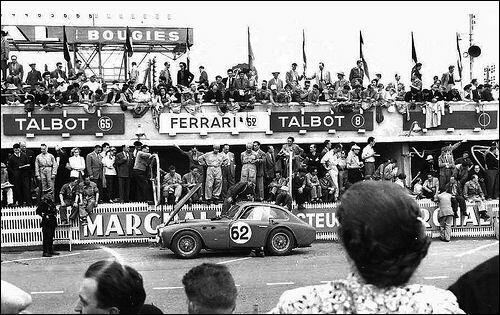 24h Le Mans 14.06.1952 Entrant: Results: perf. 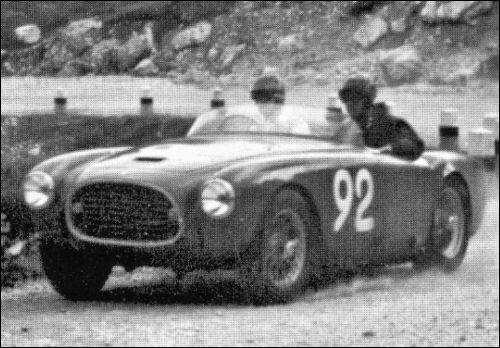 1950 166 MM Barchetta Touring (#0052M) at Targa Florio. 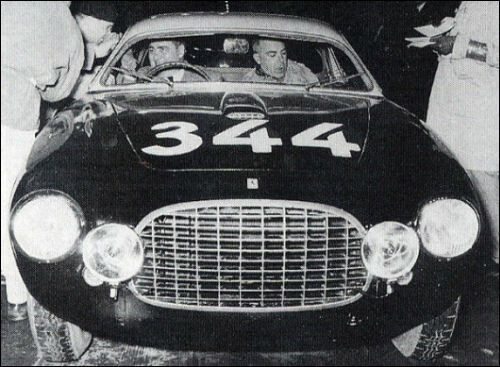 340 America (Giovanni Bracco) at Targa Florio. 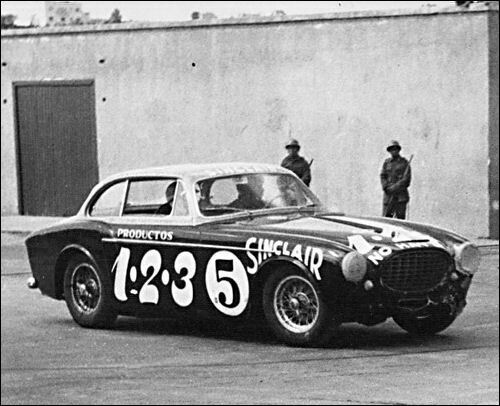 340 America #0202A 4102 cm³ (André Simon / Lucien Vincent) at Le Mans. 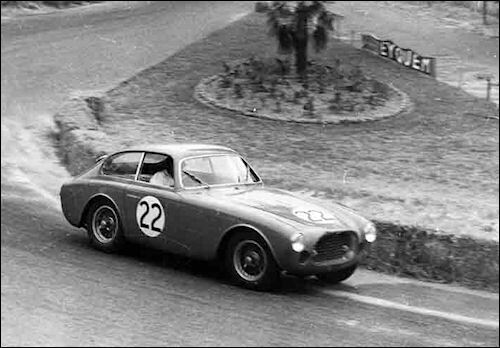 212 Export Vignale #0092E at Giro di Sicilia. 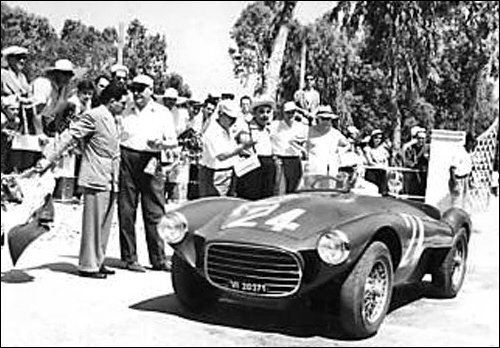 225 S Vignale Spyder (#0154ED) at Giro di Sicilia. 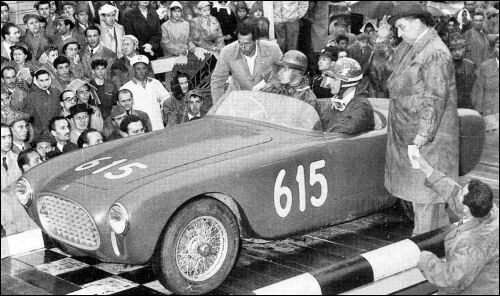 225 S Spyder Vignale (#0172ET) - the winner of Coppa d'Oro Delle Dolomiti (Paolo Marzotto). 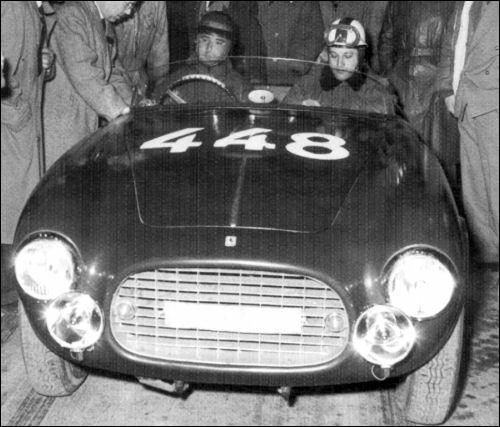 275S (#0030MT) with a 340/1 engine and a new Fontana Spyder body at Giro di Sicilia. 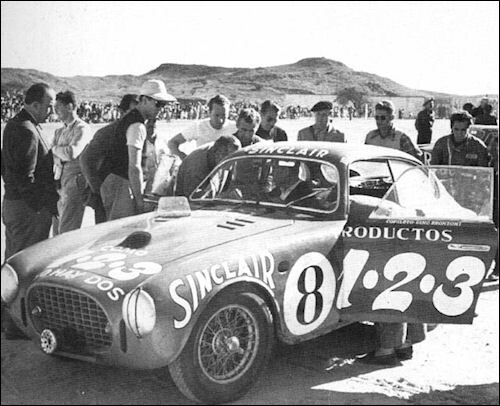 212 Inter (#0239EU) with Echeverria / Villegas at Carrera Panamericana. 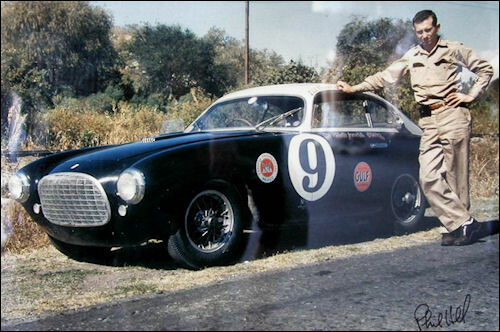 Chinetti/Lucas in 340 Mexico #0224AT at Carrera Panamericana. 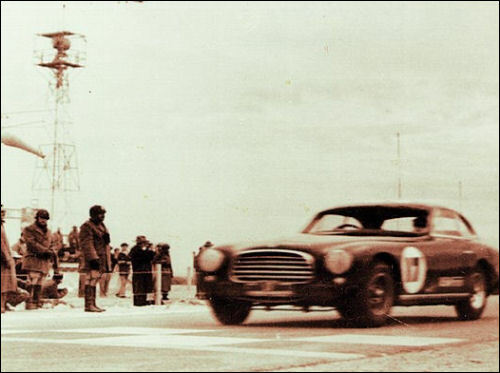 McAfee crossing the finish line 5th at Carrera Panamericana. 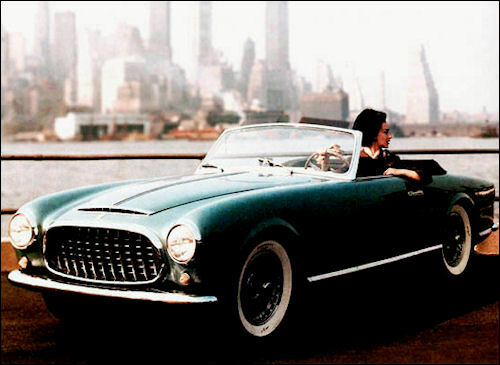 340 America Ghia Coupé (#0150A). 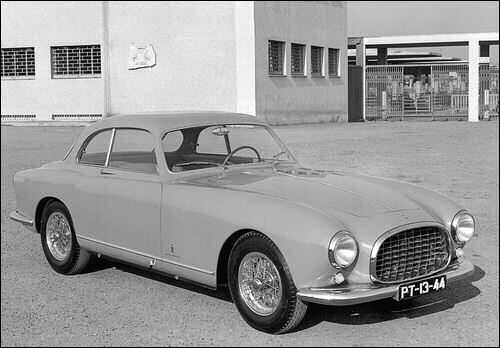 12 500 Ferrari Type 500 2.0 L4 Rosier Ecurie Rosier acc. 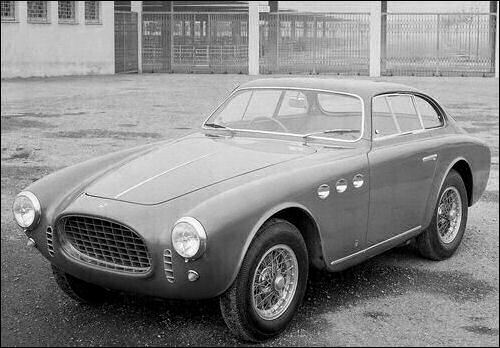 28 500 Ferrari Type 500 2.0 L4 Farina fail. 32 500 Ferrari Type 500 2.0 L4 Simon fail. 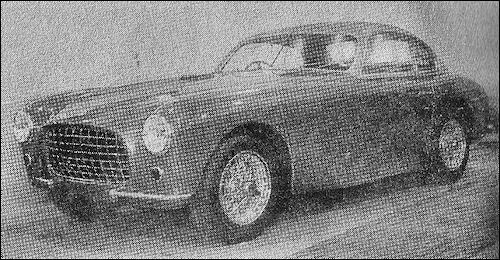 19 500 Ferrari Type 500 2.0 L4 Fisher Ecurie Espadon fail. 20 125 Ferrari 125 F1 1.5 V12 Hirt Ecurie Espadon fail. 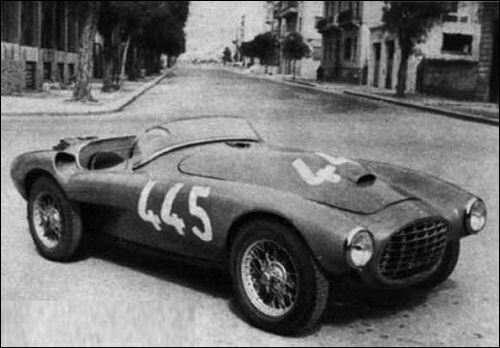 104 166F2 Ferrari 125 F1 1.5 V12 Carini Scuderia Marzotto fail. 118 125 Ferrari 125 F1 1.5 V12 Schoeller Ecurie Espadon fail. 24 500 Ferrari Type 500 2.0 L4 de Tornaco Francorchamps fail. 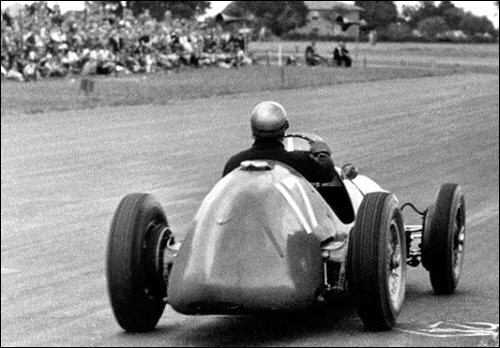 Ferrari 500 driven by Piero Taruffi at British GP, Silverstone. 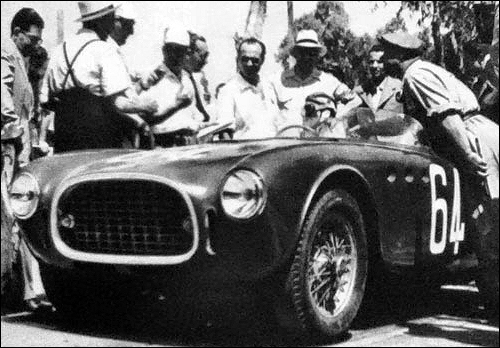 ALMOST monotonous were Ascari's victories in 1952 with the 2-litre Ferrari. Here he is well in the lead during the European Grand Prix on the spectacular Spa-Francorchamps circuit. His easy driving position is typified in this close-up. 375 S at Indianapols 500. 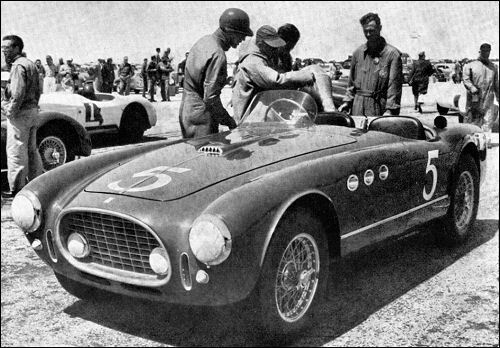 Indianapolis 500 : Alberto Ascari and Ferrari crew checking out racecar 375 Special.